Rate this Article A new company has entered the world of eSports event steaming. With the use of an innovative VR spectator proprietary system, Sliver tv intends to bring you eSports from a very different poin-of-view. With the popularity today of both eSports and Virtual Reality, it wouldn’t come as a surprise that both of them can be merged with each other. The possibilities of using VR and AR to play eSports are already currently being explored by the developers and manufacturers of these devices and the results for application though it will still take time looks positive and very promising. But what about watching eSport events which has already been proven to be a very lucrative market with millions of people either attending the actual event or glued to the screen via streaming on-line platforms like Twitch. The reason why investors keep supporting eSports via on-line and actual advertisements that reaches out to people in the millions. Imagine the possibilities of using VR to view the actual eSports events in the millions. VR headset manufacturers would make not just a killing but a genocidal massacre in headset sales if VR game spectator technology takes off and becomes a very popular way to view eSports. Just imagine a seated audience in a packed stadium all wearing VR headsets. The game begins and everybody simultaneously turn their heads in all different directions murmuring ohhhs and ahhhs or screaming for their team to get it over with. This would definitely be something funny to watch but if you’re the one wearing the VR device, it would be awesome. Sliver tv, a Cupertino based company recently raised 6.2 million USD in funding to develop their proprietary VR spectator technology for widespread use. Established in 2015 by partners Mitch Liu (CEO) and Jieyi Long (Chief Architect) both veterans in the eSports arena, the duo aims to bring a VR version of Twitch tv to both eSports and VR fans around the world. Investors include Sierra Ventures, DCM Ventures, The VR Fund, CAA Ventures, Colopl, BDMI, and Greycroft Partners. As for eSports, the top three games will be supported. These are DOTA 2, League of Legends and Counter Strike GO. Sliver tv’s proprietary VR technology employs the use of a spherical 360 degree VR viewpoint to view current eSport events playbacks. The technology is quite new and in continual application and development as it will be used in tandem with global eSports events which are sponsored by the likes of ESL and other mainstream eSports organizations. The technology behind Sliver’s VR spectating capability is a complex one but in general terms it uses the multiple camera array method used by 360 degree video recording and films that you can commonly find in You Tube today. You’ll usually see a circular direction button at the upper left of the screen. For VR, the normal eSports game events are recorded with a virtual multiple camera array application. Let’s say an actual game play of DOTA 2. Sliver’s proprietary technology uses 3 pairs of virtual cameras to record the game play in a 360 degree left-right-up-down point of view but note that the game itself is not in VR. It’s on the PC screen. The company maintains a server where their proprietary App resides and runs. Let’s just say that the game is recorded at a much lower resolution and frame rate of the actual game play, but this are multiple recordings for the direction the multiple virtual cameras span and record. This multiple recordings are then processed by the App where they are up-scaled to a higher resolution at the same time interpolating (sort of predicting how the next movement or frame will be and stitching them all together) based on the video frames of the neighboring camera to create a united single high resolution 360 degree video that can be played on a VR headset. Of course the process is more complex than the above explanation which is already as simple as possible and has caused me to almost have a nosebleed trying to interpret the technical info., but there you have it. 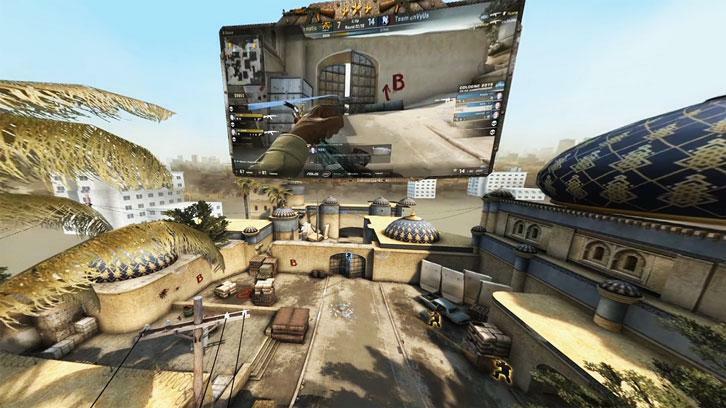 The videos are stored in whatever storage device the server uses ready for streaming, download and playback for the VR eSport spectator to watch. Watching them play in VR however can be fun but still taxing. Imagine that you can see everything around you if you move your head. You can even see the opponent sneaking behind the unsuspecting player. You however can choose not to move so much as there is no one running after you or waiting in a corner for a clear headshot. RTS will give you the same 360degree up and down point-of-view but can probably be disorienting and confusing at first as you’ll have to search for those tinny whinny warriors running around the field in all different directions. Unlike on the screen where the action is automatically located and zoomed for everyone to see, you’ll have to look around in VR yourself cause you’ll see things from a much much wider perspective. Watching eSports playbacks and actual events in the times to come would really be an interesting if not awesome thing to do. With the technology initially available for free for Android, IOS and an early access on Steam, let’s see what the future will bring.